I’ve been embarking on a food adventure of a different kind the last couple weeks. It started when I was eating a slab of frozen cookie dough like a slice of deep dish pizza, which happened to occur the day after I ate half a box of Girl Scout Tagalongs in one sitting, and I thought ‘Is it any wonder I have no energy and live in a constant state of heartburn? I am not 16 anymore. My body can’t take this kind of abuse.’ Especially when I wasn’t even hungry. I know I’m the Hungry Redhead and all, but more and more I find myself mindlessly eating. I kept telling myself to eat healthier, but somehow eating oatmeal for breakfast, a salad for lunch and vegetable stir-fry for diner meant it was okay to eat half a chocolate cake before I went to bed. So I needed to do something more drastic. I needed something strict, with rules. I needed something that forced me to cut back on my sugar intake… I needed to go Paleo. Actually, I’d say I’ve gone Pagen, because I still make several violations to the Paleo doctrine (which varies a lot anyway depending on who you talk to). And how am I supposed to keep baking if I’m not allowed flour and sugar? Long story short, Paleo is high protein, high veggies and low, low, low carbs. It’s forced me to actually cook meat, which I realized I never did much. As it turns out, I rock at cooking meat. Also, it turns out to be super easy to improvise when cooking meat. Take this for example. 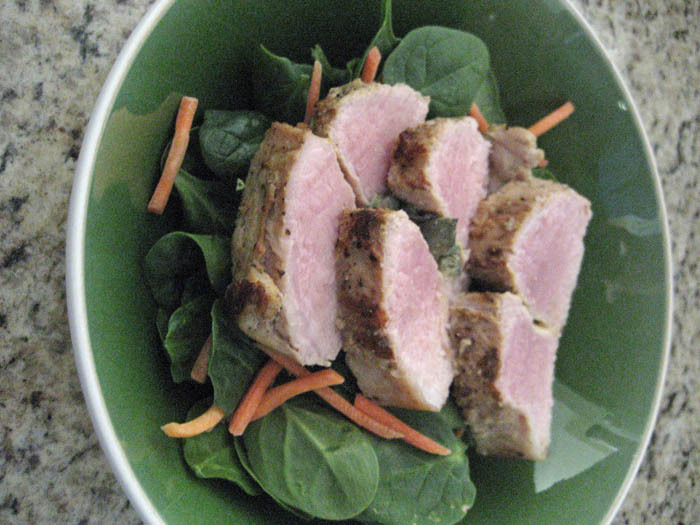 I knew I loved pork tenderloin. I knew pork and mustard paired well together. I knew pork and sage paired well together. 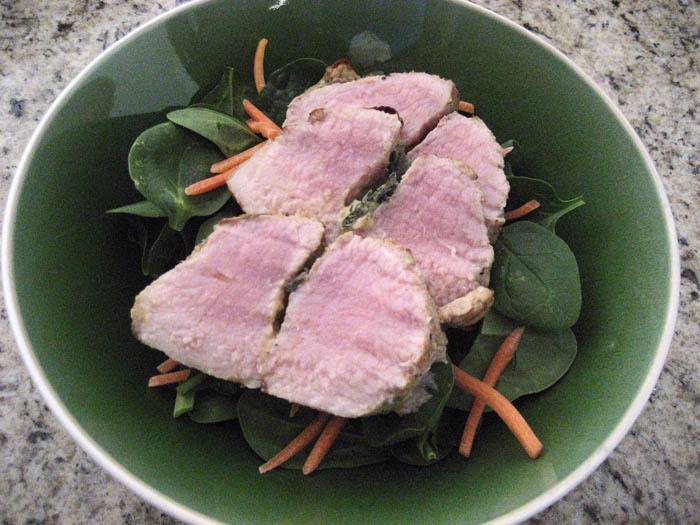 Hmmm… I wonder if I could stuff a pork tenderloin with mustard and sage? 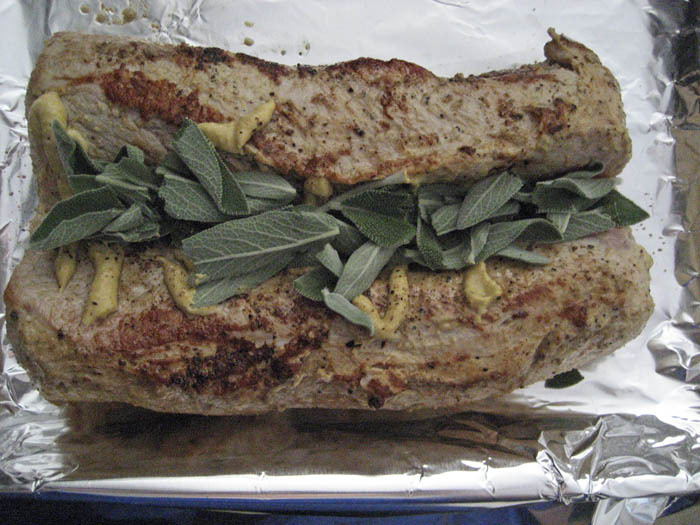 Having never cooked a pork tenderloin in my life, I started by cutting a slit down the center of the tenderloin and dolloped in the dijon, then tore up sage leaves and pressed them into the mustard. I closed the tenderloin back up with toothpicks, smothered some more mustard on the outside and popped it in the oven according to the directions that accompanied the tenderloin. Wowza. This was as good as any tenderloin I’ve had in a restaurant (save for the ones smothered in a sweet red wine reduction or on top of a big bed of red potatoes, but alas, that would not be Paleo). The inside was perfectly juicy and tender with the right amount of pink in the center and the flavor from the dijon was present in every bite. To make sure I got my veggies, I sliced it and served it over a spinach salad. Depending on how you dress your salad and the size of your slices, this meal is under 400 calories, but so filling and good for you. That’s been the big thing I’ve taken away thus far from my new eating plan – how much more filling protein is versus meals padded with rice, bread or pasta, and yet half the calories. You’re actually consuming more food for less calories. The whole process has also gotten me to pay more attention to what I’m eating and has been an eye opener in terms of how much I depend on sugar. It really has been like kicking an addiction. I still crave sweets constantly, it makes me pretty agitated at times, gives me headaches or makes it hard to focus, but it gets better each day… or until I cheat because I’m baking. Told you: Pagen. Preheat oven according to tenderloin’s packaged directions. Likely to be 350 or 375 F.
While oven is heating, slice the tenderloin in half, lengthwise, being careful not to cut all the way through the meat. Open up the tenderloin, season with salt and pepper. Spread 1 tbsp of the dijon mustard inside the slit you’ve cut, rubbing the mustard into the meat with your fingers. Tear up the sage leaves into pieces by hands and sprinkle over the mustard. Fold the pork loin back together, securing with toothpicks. Massage the remaining 1 tbsp of mustard around the outside of the tenderloin. Season again with salt and pepper. 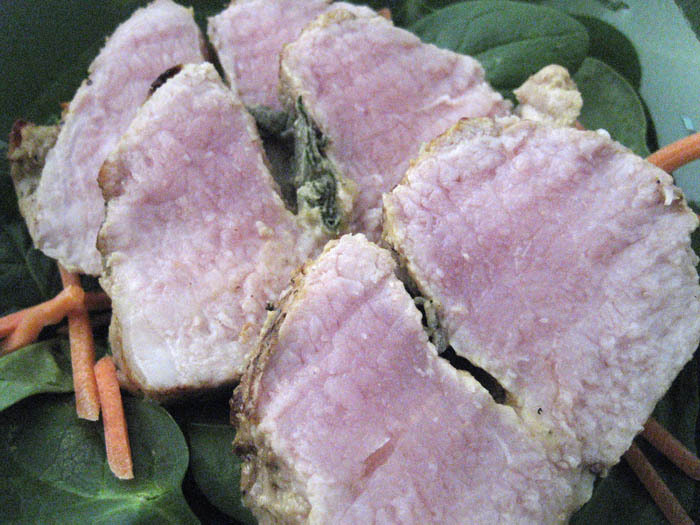 Place tenderloin in a baking dish sprayed with cooking spray. Put in oven and bake according to package instructions or until the internal temperature reads 145 degrees (likely 20 – 30 min). Remove from oven and let sit for 10 minutes. Slice and serve. I recommend removing the sage leaves before eating. Pork is one of my favorites but I wish I made it more often! And I agree, protein is VERY filling. I love it.